While I was writing this article to keep up with the latest game trends, my kids were shouting each other to focus on the TV at 18:30. They were going to see NINJA together and started to present a variety of toys with different shapes of ideas from the movie. One of them, although still sitting with his friends, is still holding his smartphone and playing games. So it is still fascinated with that TV show by playing a game with characters in the movie. Recently, LEGO System A/S has just launched a brand new game that takes on the theme of the famous ninja in the LEGO format. 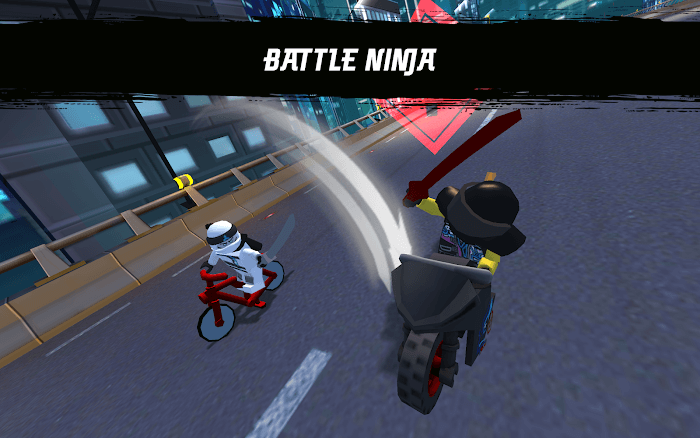 LEGO NINJAGO: Ride Ninja takes players to the world in the movie through the furious races. The story of the game is not so different from the film when our team still have to fight with the Sons of Garmadon. 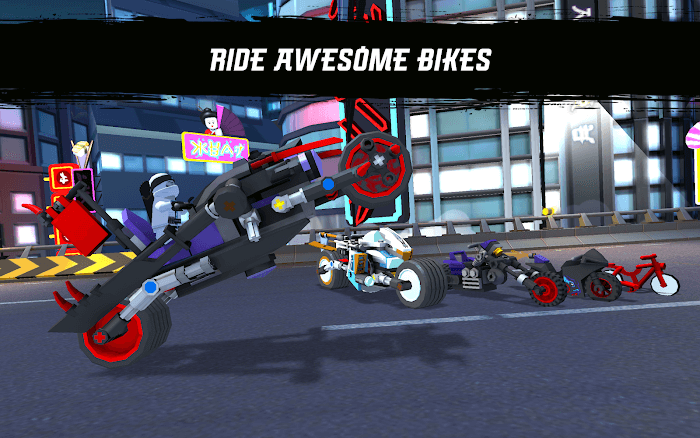 Zane – a member of the team, has gone undercover and infiltrated into that gang of criminals. But for them to officially trust and give high-level missions, he must pass the intercontinental competition of the gang called the Street Race of Snake Jaguar! You will have to race and put yourself and other life-threatening situations. But in return, you are driving extremely impressive cars from bicycles to large motorcycle moto, even to the motorcycles with 4 wheels, … Choose the car that best suits the department. I like it and can control it smoothly because the player must avoid the cars of ordinary people go all the way. But that is not all, the opponent ninja also hard to find ways to kill you. Destroy them before they kill you. 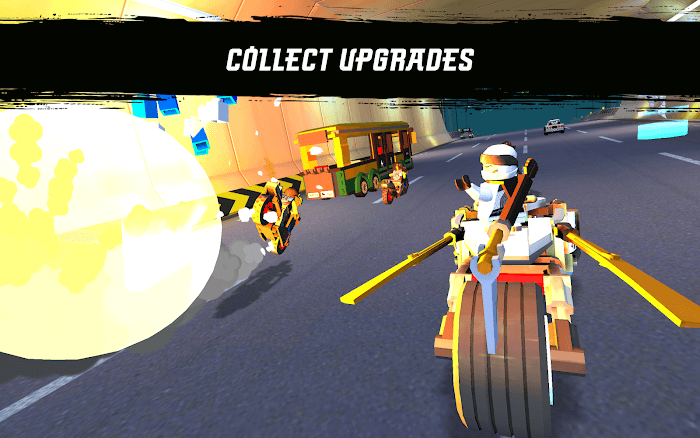 Pick up the upgraded items and drive to the finish line to win the race. It can not be denied that the original graphics of the film NINJAGO was very suitable and attract viewers. In the game designers still, retain the essence of the filmmakers. Besides, they make their characters move smoother and more suited to being manipulated in the game. Also, they are equipped with a variety of weapons to fight the same design in real life as Katana, AK47, … The car is the focus of this game, so they are very much in favour of the model. The code is incredibly diverse and vibrant. Some models come up with ideas and remakes like real cars and also imaginative vehicles, which can perform utopian functions. The course is beautifully designed and has a very accurate hitbox, players can perform beautiful drift without fear of lag or display errors. Scenic surroundings are skyscrapers in the bustling city, where the streets are large but filled with steady traffic. Getting ideas from well-known movie series is one of the safest and most secure ways to earn revenue for a game publisher when the movie fans themselves are already in favour of the game. But if you do not love the original series, then try to play the game once because it is quite entertaining.